Message: great quality good engraving, clear, quick to deliver all in all purrrfect for my cat tala! Message: Best dog tags I have ever purchased. The engraving is really deep and doesn't wear. Have recommended them to friends and all the dog owners at our local dog club. 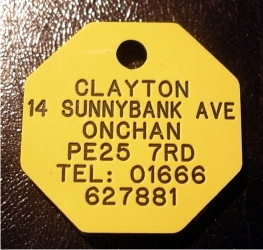 Message: Fast efficient service, clear readable tags would have no hesitation in recommending to all. Message: Excellent quality, my mother bought some brass tags five years ago, best buy she ever made. Now my dog sports the same tag and looks great!